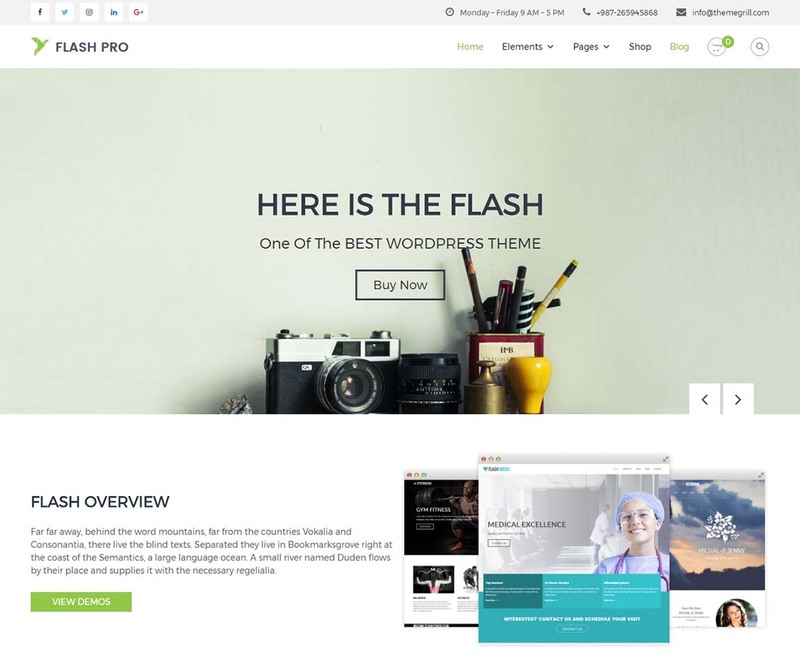 If you have made up your mind to create a great website, you might probably need to check out the best premium WordPress themes on the web. WordPress platform may be the first choice to power your website as it is the most popular CMS today. It powers over 35% of all CMS based websites online. WordPress is awesome being a free and open-source framework, offers plenty of resources – free themes, free plugins, free support and more. Yes, there are thousands of WordPress themes online completely for FREE. Using a free theme surely saves you some pennies from the budget, yet you may confront lots of limitations including poor support, poor design, fewer features etc. So, if you want to create a full-fledged powerful website, free stuff may not be a good idea. 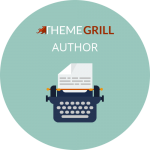 In general, a premium theme costs you $45 to $99 which is often the total budget for your entire project. And that’s not a big amount for a complete website. Have a question ‘how is it possible’? It is because WordPress is easy to use. The real essence of WordPress lies in its simplicity – you can easily install WordPress, customize the theme, and build a website. Furthermore, you will get theme documentation for each theme which includes instructions how to use the theme. Most of the theme authors provide dedicated support so that your queries and issues are instantly solved. And, there are also plenty of other resources like blogs, tutorials, videos, etc. that are useful to you. Not only that, a fine-tuned and feature-rich theme can save a chunk of money you may pay to a web development company. According to Techie Ride, if you ask any one web development company or a freelancing web developer, it may cost you three times more than buying a premium theme. If you search ‘best WordPress themes’ on the web, you will find a number of themes each claiming to be the best of all. You can’t simply trust them. There are various factors you need to have a close eye into before switching in with any theme. Firstly, the theme has to be cleanly coded up to the standards defined by the WordPress. Furthermore, the customizability, design, plugin support etc. are vital things to be considered. On top of everything, you must be sure that the theme is created by the professional developers and they provide dedicated support to their customers. So, it is a handpicked list of such themes that will ensure all the virtues you may seek in a theme. Most of the themes in the list also have free versions in the official WordPress theme repository and are among the most popular themes for WordPress. This theme has solid support for the popular page builder plugin by SiteOrigin which smoothly works with Flash Toolkit widgets. Flash Toolkit is an ‘exclusive companion plugin’ for Flash theme comprising of more than 18 awesome drag and drop widgets. The theme is fully compatible with WooCommerce, Events manager, and all the major WordPress plugins. It has 7 stunning demos and more demos are coming on the way. You can import demo content and give a quick start with demo content. 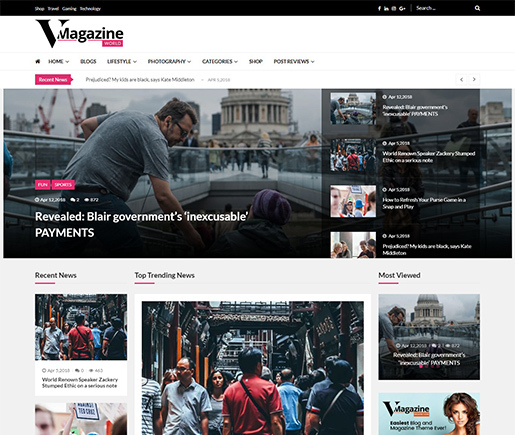 VMagazine is a unique and creative concept WordPress news and magazine theme designed especially with editorial sites in mind. The modern and stylish interface is visually appealing and stunningly beautiful. Each and every little detail has been carefully placed and crafted for maximum effectiveness. Furthermore, the layout structure is completely responsive and retina-ready. Built to be SEO friendly and optimized for speed, this template makes sure that your site always ranks on top. Additionally, the theme also comes with tons of amazing customization options. It includes 6 prebuilt demos, 4 different header styles, 50+ magazine post blocks and 3 built-in post review options to choose from. What’s more is that you also get the option for One-Click Demo Import so you no longer need to start from scratch. Other appealing features of this theme are, 20+ engaging widgets, mega menu, Live Ajax search, and WooCommerce compatibility! Get the perfect platform for your users to interact only with VMagazine! Divi defines itself as an Ultimate WordPress Theme and Visual Page Builder and rightly so, as it might be one of the most powerful, highly customizable and elegant theme out there. No matter what you want your page to represent, Divi helps you create your dream website. Whether it be business or blogging, Divi ensures that you have the tools to create the perfect web-design, all in no time. Divi’s page builder plugin, aptly named ‘Divi Builder’ is probably one of the best page builders we’ve seen so far. It that lets you customize every part of the page just by clicking on it, dragging and dropping. Simply turn on and off any possible element you can imagine and you’ll have your webpage ready to go. Social media integration, Video/Audio boxes, Sliders, Pricing tables, portfolios, it has it all and you can easily enable them wherever you want. Furthermore, the theme comes with 20+ premade layouts fit for every occasion as well as a layout import/exporter so you can start working the second you get the theme. The theme also has a dedicated support team for your help and the subscription fee gives you yearly access to all the related plugins, themes and more. 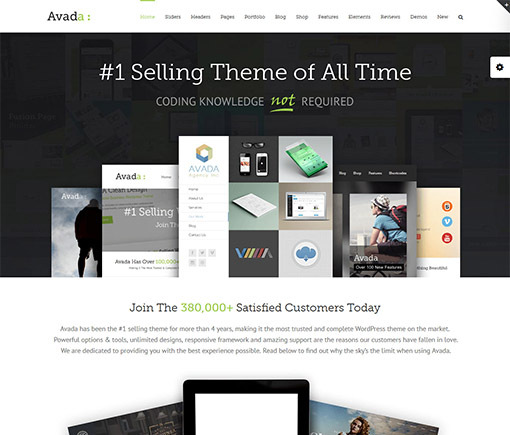 An extremely versatile and highly responsive WordPress theme, Avada is probably one of the most customizable themes available on the web. Fit for every purpose imaginable, its highly responsive, minimalistic and aesthetically pleasing design is sure to wow every kind of viewer. 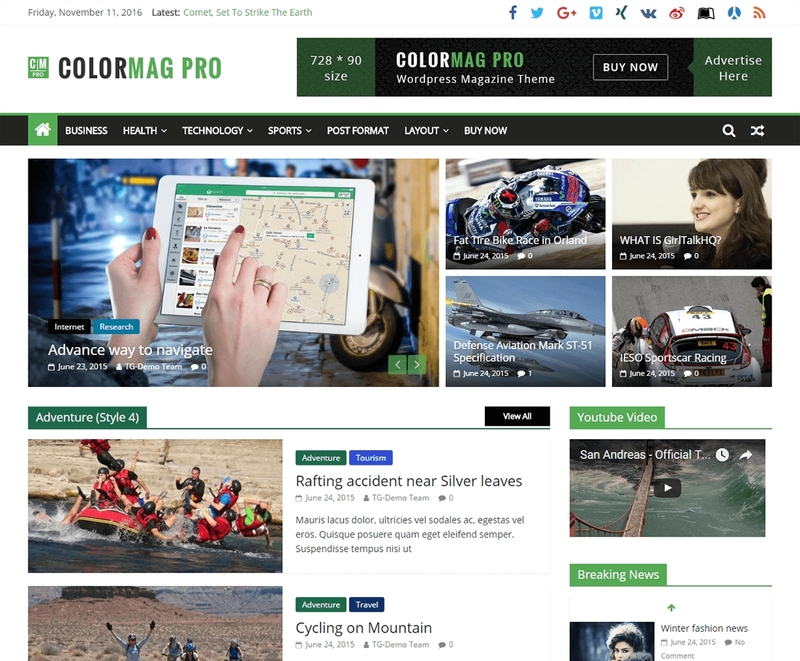 ColorMag Pro is yet another most loved WordPress theme for its magnificent magazine-style design and powerful support. It is a wonderful WordPress magazine theme which lets you create a complete online magazine in no time. It is a fully responsive theme that adapts perfectly to any type, size of the device including desktops, laptops, tablets as well as mobile devices. ColorMag Pro features advanced typography so that you can customize the type, color, size of the fonts unlimited. You can also choose any font you like from the 600 plus Google fonts available. It is a fully widgetized theme with more than 15 custom widgets that let you beautifully add content in your site easily. Furthermore, it is WooCommerce compatible, supports RTL, SEO optimized, speed optimized, and cross-browser compatible. The theme has an option to import demo data – you can import the demo data in a single click, customize it and instantly create a demo like a website. Doesn’t really take that much to realize that Newspaper is the best news WordPress theme developed for Blogs, articles, magazines and moreover news-based websites. How good is it, you may ask? 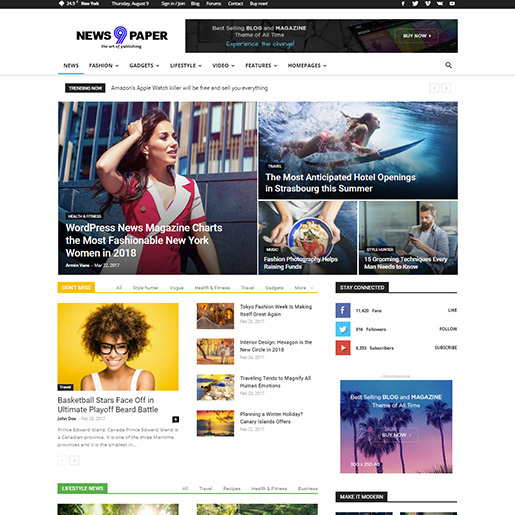 The highly rated theme distinguishes from others with a front end page builder made for news and magazine websites, beautiful one-click demos, premium features, and an immersive collection of pre-made template designs. With the tagDiv Composer page builder and the tagDiv Cloud Library, any page or post can be highly customized using the drag and drop functionality, right on the front end of your website. Newspaper is a blogging, magazine-oriented theme that comes with tagDiv Composer. A highly optimized, easy to use page builder with over 100 handcrafted elements for web page designing. The drag-drop builder requires no prior coding knowledge. The theme is great from a business perspective as well since it comes with efficient AdSense and banner ads with over 14 predefined and 5 custom spots for global advertisements. Also, you can include ads on individual pages or posts using the tagDiv Composer and the dedicated elements such as Ad Box or Single Post Content. The Newspaper theme comes with support for almost every possible content type and comes with native video support for YouTube, Vimeo, and Dailymotion. 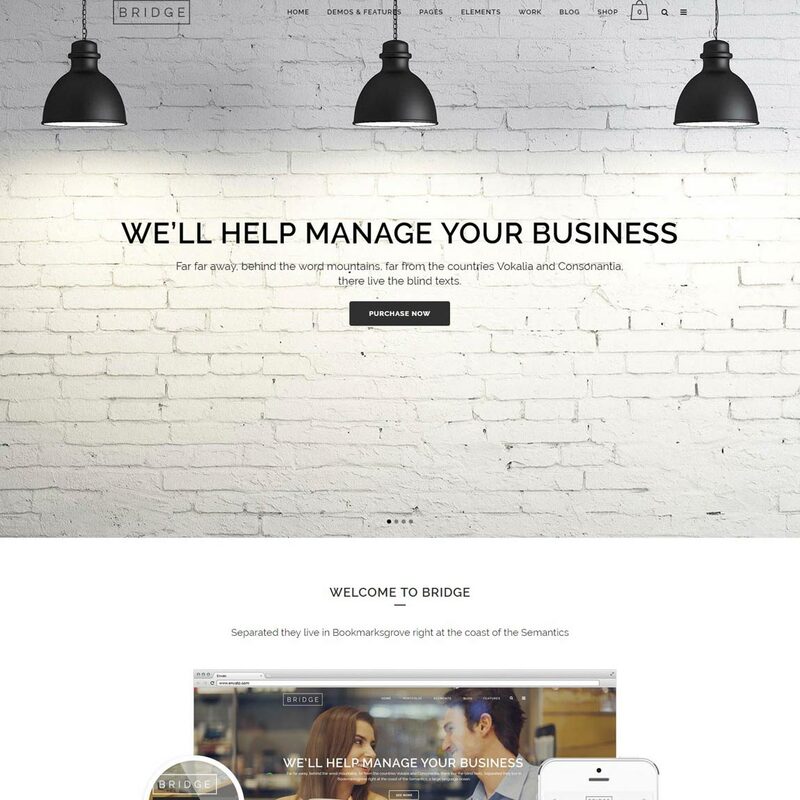 Bridge is more than just a simple WordPress Theme. Bridget can be simply described as an amazing WordPress website builder. The theme’s wide variation of options, page builder integration and huge modules list lets you create unique website designs on the go. The intuitive WordPress theme provides you a staggering amount of customization options and open-ended modification. Freely change any of your website details to an extremely detailed degree and ensure that your website provides an unreplicable feeling to visitors. From simple color changes to detailed layout changes and more, you can easily manage your website’s presentation factor using the detailed theme options Bridge provides you with. Bridge makes full use of the Visual Composer page builder to help you easily produce, arrange and manage content all over your website. With the extra bundled plugins such as Slider revolution, Layer slider and Responsive Schedule you can enable useful elements to improve your website’s usability. And if the wide range of customization options wasn’t enough, you can also use over 376+ pre-built demos to get your site up and running in an instant. Magazine demos, E-shop demos, Blog demos, niche based website demos and more, you can select from variations of them all and adjust them to your demands. If you find yourself in a pinch and need some help, you can make use of Bridge’s dedicated Support team to help you out whenever necessary. If a WordPress theme is based on the cutting-edge WordPress technology and integrates the best of the WordPress products/ plugins, it certainly has to be the trending one. 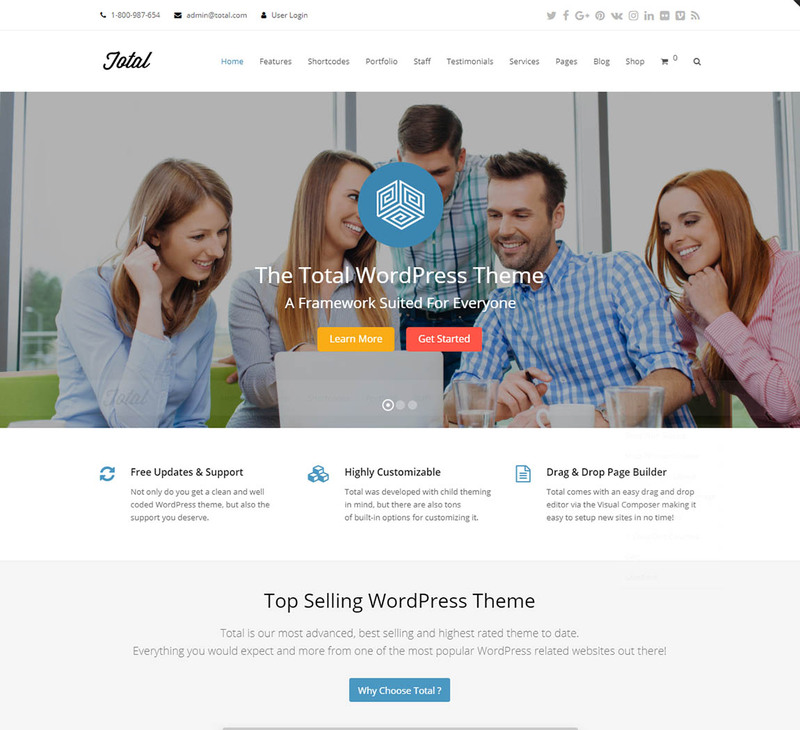 So is Total theme; trending on the biggest theme marketplace ThemeForest and definitely one of the best-selling themes ever with over 25,000 happy customers. Just as its name, Total comes as a total package for building beautiful WordPress websites. Total theme is truly a multipurpose and feature-rich theme which offers limitless customization possibilities. It comes bundled and deeply integrated with the most popular WP plugins Visual Composer page builder plugin, Templatera, Slider Revolution, and Layer Slider (worth $91) which is more than a huge bonus. Besides, it is fully compatible with all the major WP plugins. Just as the features, the theme user interface is really amazing – clean, simple and beginner-friendly. In the nutshell, it won’t be wrong to say that ‘Total’ is the total/ ultimate theme you may ever need. If you are looking for a flexible and incredibly amazing WordPress theme for your website, then look no further. 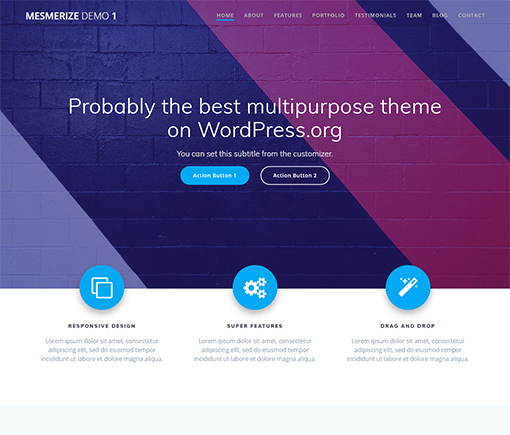 Mesmerize by Extend Themes is a stunning Multipurpose WordPress theme that boosts your design powers. Combine design options like background, graphics separator and overlay to get the striking look that no one can look away from! Just as the name suggests, mesmerize anyone who decides to visit your website! Being incredibly multi-purpose and flexible get limitless possibilities. Get full control over each section and customize it to your preference. The theme is packed with tons od Page variations that you can use. The appealing call-to-action makes it impossible for your users to ignore. You can also showcase your skills and projects with tons of Counters and Portfolio options. This template further features outstanding hero sections created just for you. Create any type of website possible with ease, only with Mesmerize. 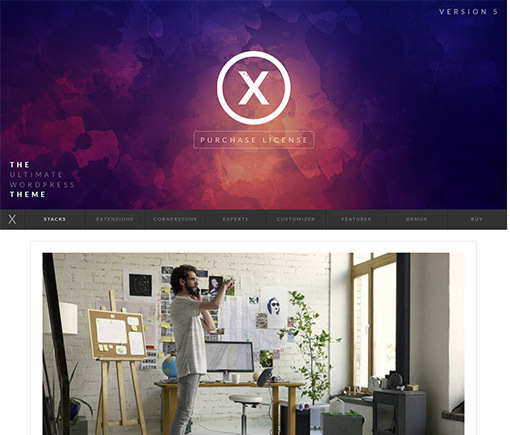 X | The theme is a highly intuitive theme that lets you instantly change the theme of your website to fit its purpose with just a click of a button. The theme comes with amazing designs, each fit for a specific kind of website design, with multiple designs and so much customization that you’ll have a hard time choosing a design rather than finding one. X theme comes with an accompanying license of Cornerstone, one of the most powerful page builder plugins available to WordPress users. This lets you easily manage your website’s view and add a little more shine to it if you want using the power of CSS. The extension is also shipped with over 26 native plugins making sure that you don’t need to add any more plugins for your website to function efficiently. X theme also gives u customized shortcodes for exclusive features such as Responsive Visibility (for platform-based visibility), Table of Contents and more. 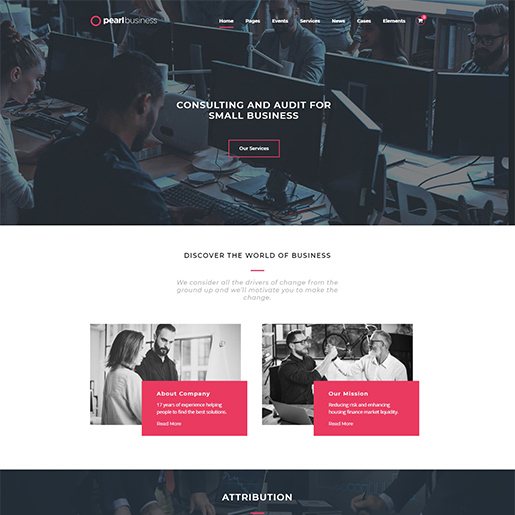 Sydney Pro is an awesome WordPress business theme suitable for all kinds of business websites as well as freelancer/ portfolio websites. The free version of the Sydney theme has been one of the most popular themes in the official WP theme repository since 2015. The theme has a simple yet an amazingly beautiful layout which is sure to please everyone. 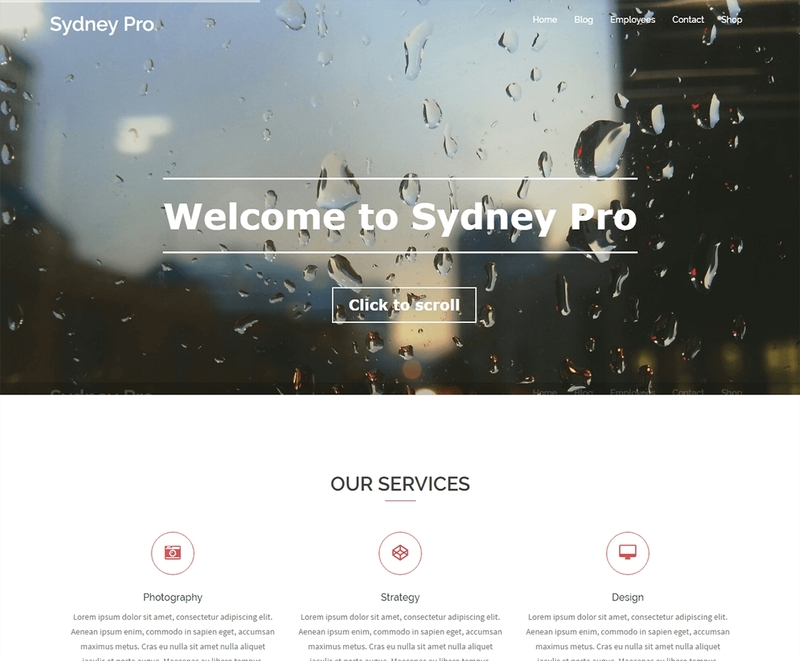 Sydney Pro theme comes with a bunch of powerful features that allow you to create a full-fledged website in no time. It features crelly slider, extra page templates, extra widgets, single post/ page options, the video header, WooCommerce support etc. The theme is built by the team of highly enthusiastic WP developers following the best WordPress practices. The theme is easy to use so that anyone without coding knowledge can instantly install and create a complete website. 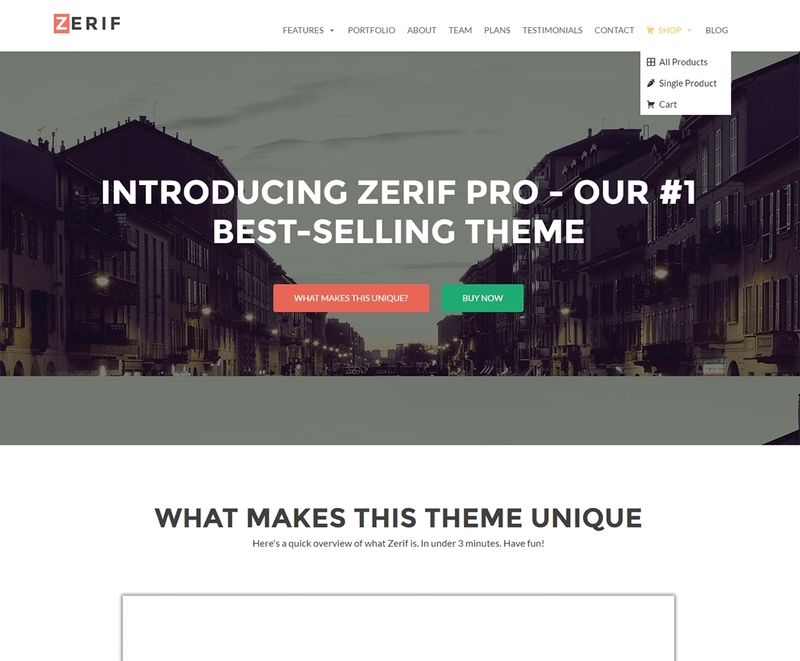 Zerif Pro is doubtlessly one of the most popular WordPress themes ever made. 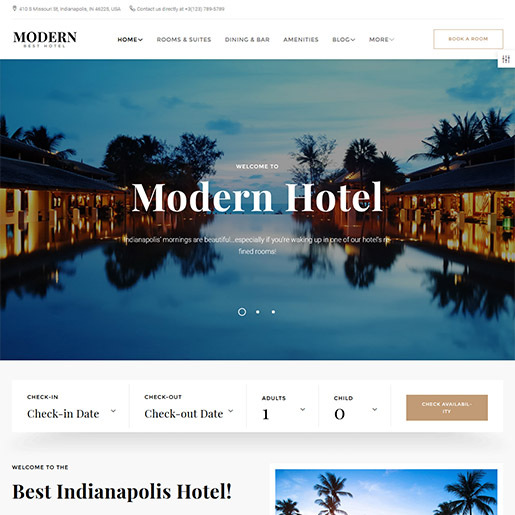 The theme offers an outstanding design layout and wonderful features which everybody loves and the theme remains on the list of the most popular themes even in 2016, 2017 and 2018. It has a fully responsive layout that looks great on any device. Zerif Pro theme is based on awesome parallax scrolling design – stunning animation effects with large images make it look graceful. It is compatible with WooCommerce so that you can easily add eCommerce features on your website. Besides, it has a deep integration with the SiteOrigin’s Page Builder which lets you limitless customization options. It is simple, easy to use theme which needs no coding knowledge while demo import option allows you import the demo data in a single click and instantly create a website that looks like the theme demo. Monstroid2 is a multipurpose theme featuring a clean and minimalistic design, built to suit any kind of user. It is a great creation by Template Monster. With over 400+ HTML file templates, 17+ Home layouts, over 80 Multi and One-page designs, Monstroid2 assures that you will make that dream website of your reality without any difficulty at all. Rather than a feature enriched WordPress theme, Monstroid2 defines itself as a fully featured, multi-purpose website template and with good reason. With dozens of masterfully crafted templates for every type of website, from portfolios to eCommerce to blogging, Monstroid2 additionally provides pre-made element and HTML files to easily build a website suitable for each purpose. The theme also comes with smooth parallax scrolling and Retina-ready design as well as a powerful search engine to make sure that your viewers find your website easy to use and accommodating on any platform. 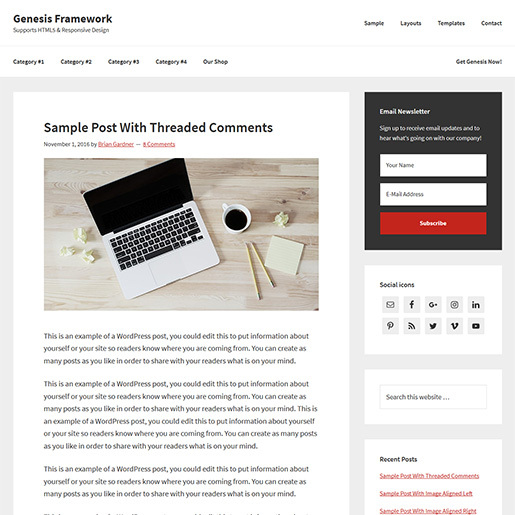 Genesis Framework is an incredibly designed theme built to create clean, smartly designed and SEO optimized websites with 0 hassles. Designed for optimization and responsiveness, the HTML5 based theme comes with impeccable security, diverse theme options and more features that you expect from a premium theme. 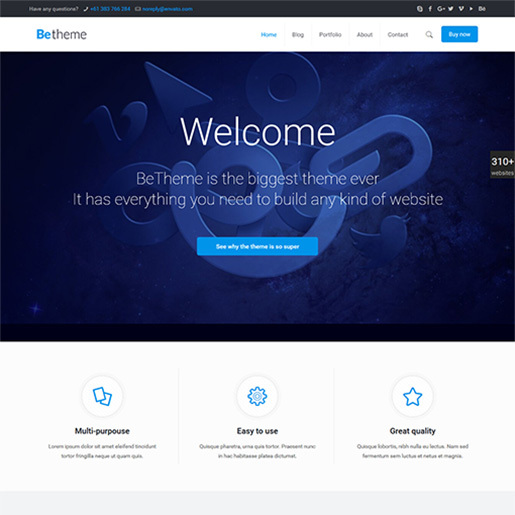 BeTheme is a highly optimized and responsive theme fit for any purpose imaginable. The theme lets you create your theme from the ground-up and easily handle every element on the website from a single mega menu and page handler. Not enough time to create your website from the scratch? No worries, you can just select from one from the insane number of 300+ pre-built Website designs. It’s that simple. The highly flexible theme comes with an inbuilt customization menu as well as Muffin Builder 3 support that lets you build your website from the ground-up with just clicking options and dragging/dropping. Pre-built pages for specific purposes, multiple-grid layouts, built-in custom widgets, Header designs, Child theme compatibility and beautiful sliders, BeTheme has it all. The theme also lets you instantly set up a new website, complete with hosting plans, Theme installation and more at the starting price of $19 per month. Pearl is an extraordinary multipurpose WordPress theme that is absolutely amazing and packed with useful features. One of the most flexible and powerful themes, it is ideal for websites of almost every niche. Featuring a clean and sleek feel to the layout, it also includes the custom Visual Composer. This allows the users access to all the components and modules at their disposal. Making sure that the users do not have to start entirely from scratch, this template also offers the exclusive feature for One-Click Demo Import. Even the useful plugins used in the dummy demos are installed alongside the whole demo you choose to import. This premium WordPress multipurpose theme is highly adaptable and offers tons of customizing options for their users. Not only this, but it is also fully responsive and retina-ready. The template is further optimized for SEO and speed making sure that your experience with Pearl is nothing short of stunning. It offers beautiful typography and custom Icon loader for the users. Don’t miss out on your global audience as this template is also multilingual and translation ready. Get unlimited custom colors and Google Maps integration. Another one to add to the list of highly customizable theme available for a premium user, The7 considers itself the Most Customizable Theme on the market. 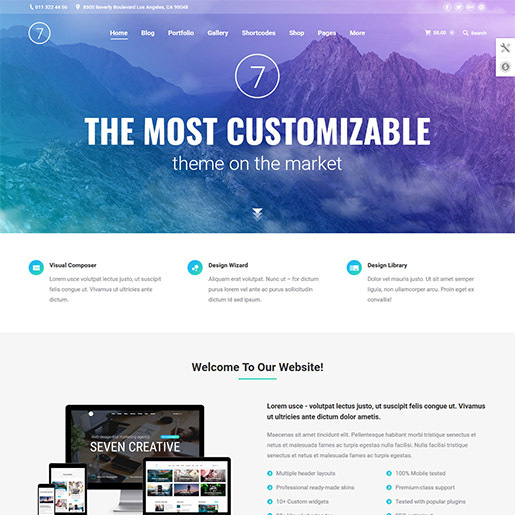 And rightly so too, with over 750 theme options, 26+ Dummy website designs, Native support for the most useful plugins on WordPress and its exclusive plugins, The7 has become one of the most used themes in the WordPress Community. The SEO friendly and Woo Commerce support theme comes with its own design manager named ‘Design Wizard’ which lets you create an Avant grade website in the matter of a few minutes. This coupled with the numerous theme options and its unlimited selection of header layouts means you can make your website’s frontend look appealing to every eye out there. Furthermore, the theme comes with native support for WPBakery Page Builder (formerly known as Visual Composer) and Ultimate Addons to add even more features to your website. The Blog/Gallery/Portfolio layouts, multiple dedicated post types, Microsite & Landing Page support, an advanced and unique page templates system and more, you can have all of this at the cheap starting price of only $39. 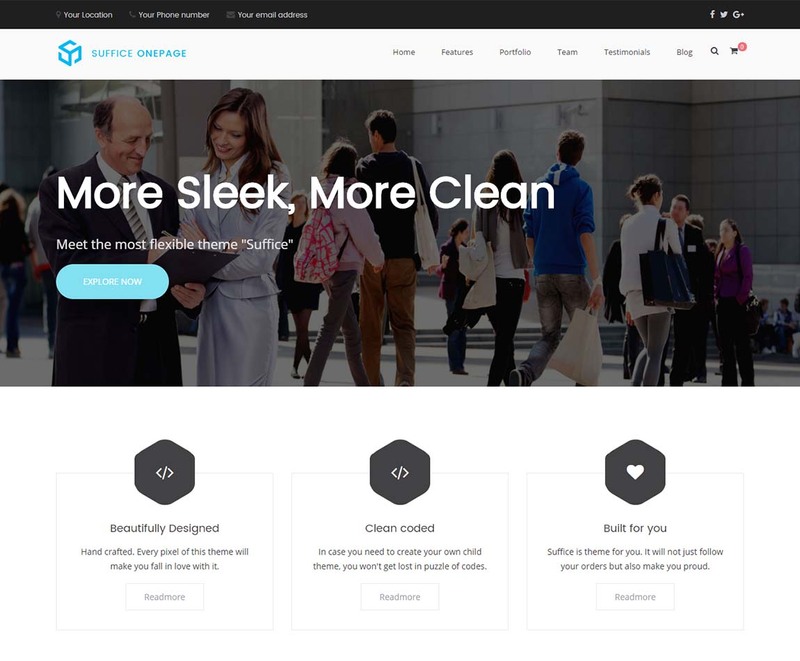 Suffice is the most powerful multipurpose theme; the ultimate theme you will ever need. It is an incredibly spectacular, visually attractive, and unbelievably functional theme for creating professional sites. Created with UX and versatility in mind, Suffice offers the simplicity, ease of use and, the power of WordPress at the best possible manner. It is the last theme, you will use. It is a fully customizable drag and drop page builder theme with full integration to Page Builder plugin by SiteOrigin. In addition, it has the privilege of a companion plugin ‘Suffice Toolkit’ which has more than 16 wonderful widgets. The theme provides 7 widget areas where you can easily drag and drop the toolkit widgets using the page builder plugin. Design possibilities are unlimited. Furthermore, you it features advanced color options, advanced typography, and multiple site layouts. 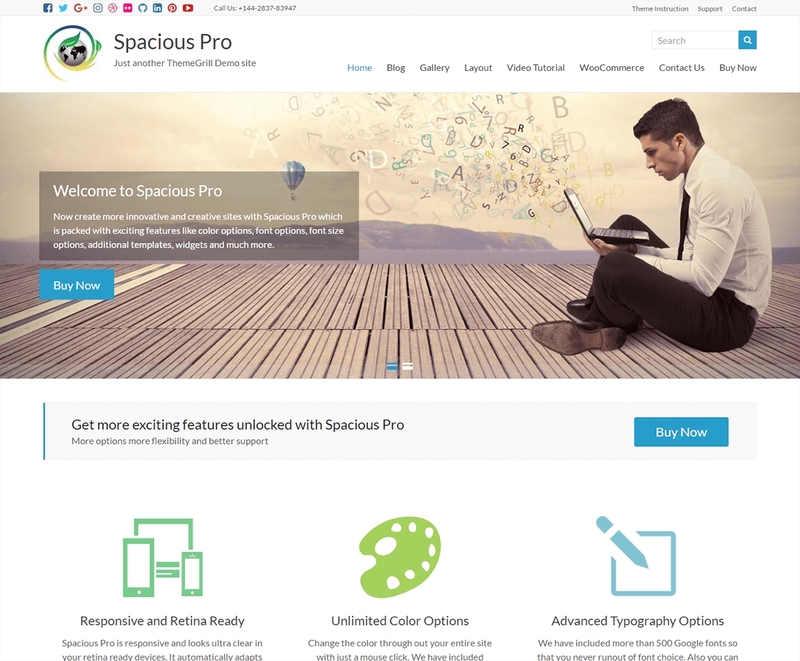 Spacious Pro is one of the best WordPress themes ever which is basically a multipurpose theme. 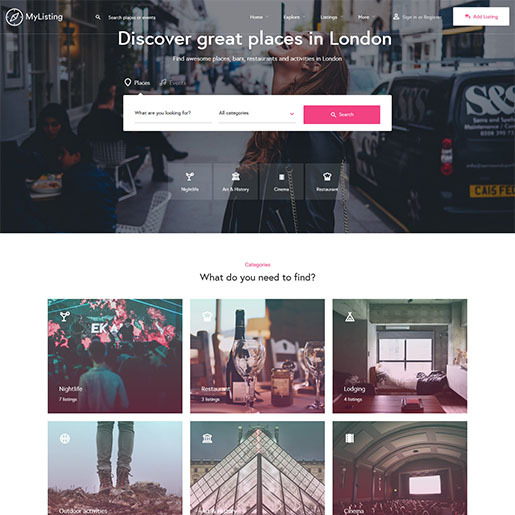 The FREE version of the theme Spacious is one of the most popular themes of 2015, 2016, 2017 and also 2018 with more than 70,000 active installs. The theme is aesthetically beautiful, highly powerful, and completely customizable while being simple and easy to use. The theme provides a professional business template along with multiple custom widgets that let you create an awesome website in no time. There are easy to use drag and drop widgets for Services, Pricing Table, Our Team, Our Clients, Featured Posts etc. and more than 12 widget areas. The theme offers you limitless customization options – unlimited colors, multiple site layouts, custom CSS and more. It is WooCommerce ready, SEO friendly, lightweight – a perfect theme for your next website. Themeforest’s number 1 rated Top seller sells itself on the basis of its highly responsive intuitive design, extremely helpful customer support and a highly accessible theme editor. 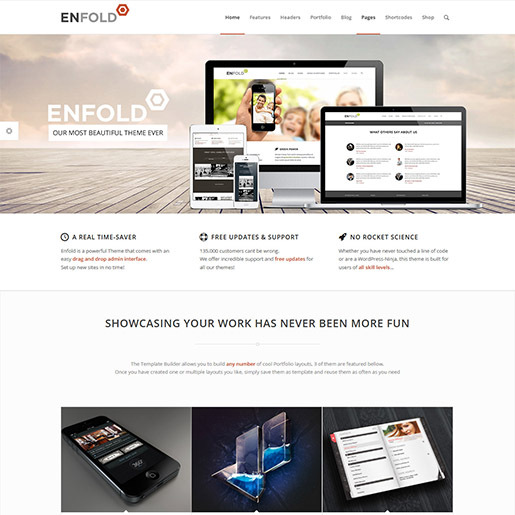 Anyone can create a perfect website design using Enfold and its exclusive Drag and Drop Template builder, just under the time span of 2 minutes. The retina-ready, multi-platform ready theme comes with a highly intuitive visual designer that lets you easily edit your page’s details, with barely any need for code brainstorming. The backend live editor makes sure that you can define your page’s look with less clutter and more ease, all with a dynamic preview of your designs. The WooCommerce supported theme also is completely Translation-ready and comes with WPML support with a highly 2d/3d slideshow just to add that extra ‘oomph’ to your website’s outlook. With over a dozen full demos available for the theme, you can really see why Enfold is one of the most popular themes out there. Uncode theme sets itself apart from other multipurpose themes available on with its emphasis on creativity. Its adaptive design sets the perfect platform for the user to build an impeccable website for you to use. And if that wasn’t enough, the theme also provides dozens of perfect themes perfect for almost every purpose, tailored perfectly for your use. The highly optimized theme proudly presents itself with a highly responsive creative web builder that features accompanying plugins such Tailored Vcomposer. The immersive page builder lets you manipulate the visual outlook easily and if you want, lets you add extra CSS to add more of a creative touch to your website design. Unique header creation, footer editing, creating a fitting module for your content, you can do it all with Uncode. The theme also comes with an enhanced media library so you can share multimedia content from websites such as YouTube, Spotify, SoundCloud, Instagram quite easily as well. Furthermore, the highly interactive slider, and over 16+ blogs and portfolio templates with over 6 menu styles lets you design an amazing blog site. Are you planning to create an eCommerce website? If you want to create an online store and sell your products online, eStore Pro is the perfect theme for you. 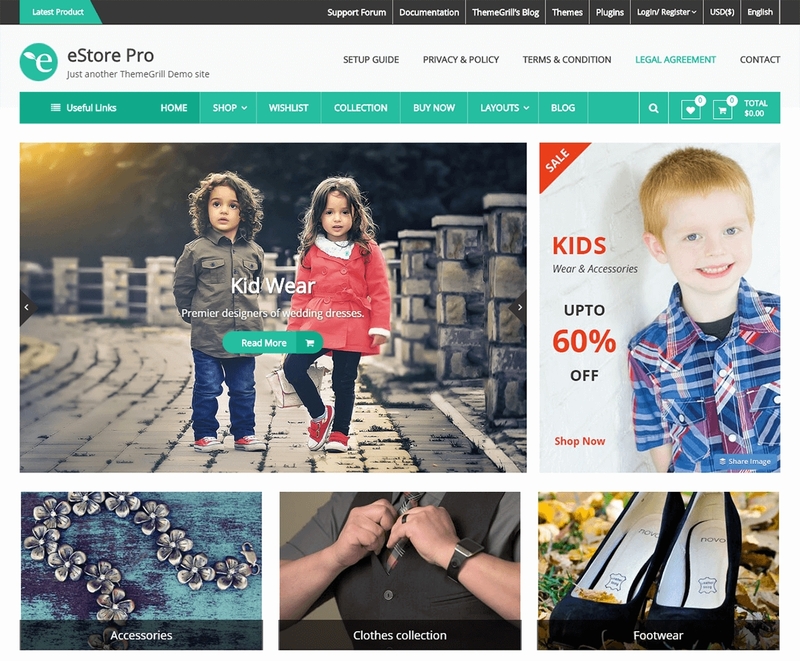 eStore Pro is an amazing WooCommerce WordPress theme which lets you create a full-fledged eCommerce website easily. Built by the experienced professionals, it provides a great user interface so that anyone can easily create a complete store website. eStore Pro has deep integration with the wonderful WooCommerce plugin and also supports other WooCommerce related plugins. It comes with collection template that allows you to show different categories and collections of products in a single page. In addition, it features 10+ widget areas, 12+ custom widgets, category colors, primary color option, advanced typography, slider options, etc. The theme is based on WordPress Live Customizer that allows you to customize most of the theme settings instantly with live previews. 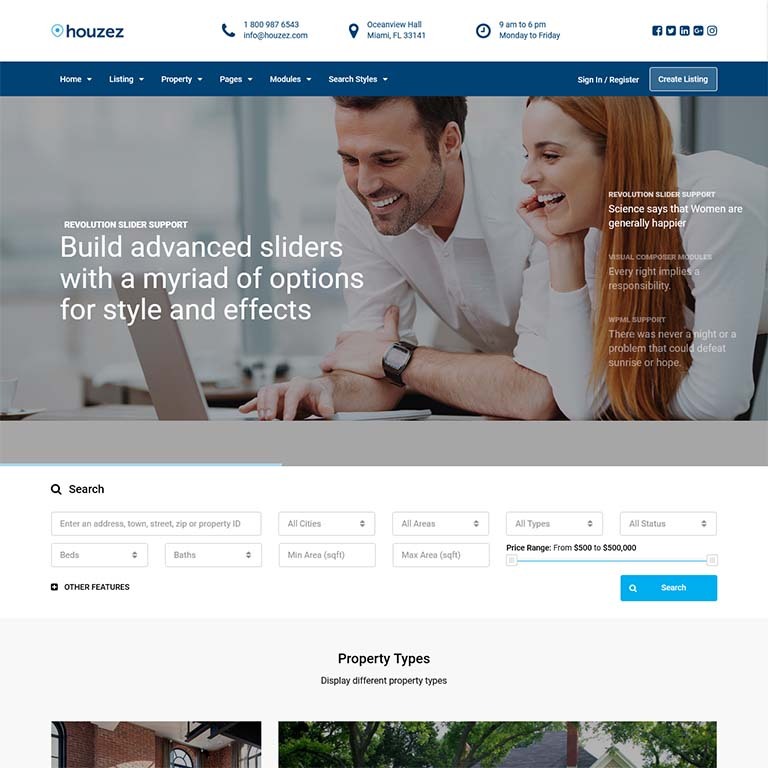 Houzez is a WordPress theme designed for Real Estate and Housing agencies, built in an optimum manner so that you can create a platform for efficient selling/buying of property. Rather than an immersive theme, Houzez defines itself as WordPress-based property management system, designed to aptly create an efficient property marketplace, commissioning and more. The theme comes with everything integral to real estate-based websites and more. From Google map integration to marking calendars, to Auto detect SSL to property ratings and reviews, it has it all. Furthermore, to enhance buyer/seller interaction, the theme has in-built messaging system, google captcha for handling spam and user role management. WPBakery Page Builder and slider revolution plugins allow you to create a responsive page design for your website on the go as well. The theme also comes with an advanced search system that allows a user to search based on proximity and location as well. As for improving page details, the theme comes with property page templates and multiple header customizations including parallax effects, Google Map integration, video integration and more. 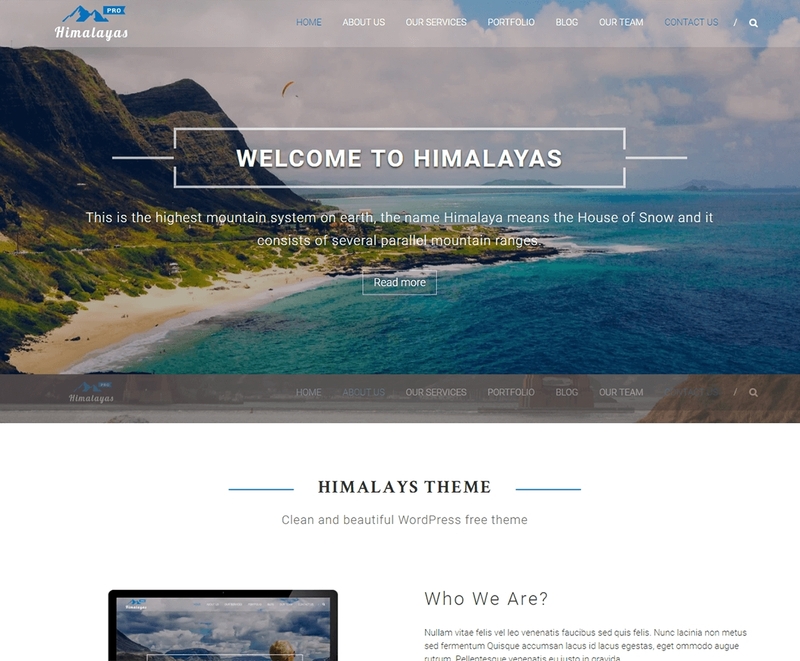 Himalayas Pro is a modern WordPress theme with the trending one-page parallax design. The theme offers an incredibly beautiful and clean layout with stunning parallax effects, bold and minimal design. It lets you create a perfect single page website which is sure to get your business to the peak like the Himalayas. Himalayas Pro theme is a multipurpose theme which can be used for creating websites for various website niches. It is perfect for business, landing page, portfolio, testimonial, agency websites etc. Major features of the theme are an awesome slider, multiple color option, advanced typography, sticky menu, social icons etc. The theme comes with 10+ easy to use custom widgets that make your task much easier and faster. It is a well-documented and SEO friendly theme. Therefore, your site can be easily ranked in the search engine result pages. The name gives it away, but Education WP was built for Educational websites and training centers. 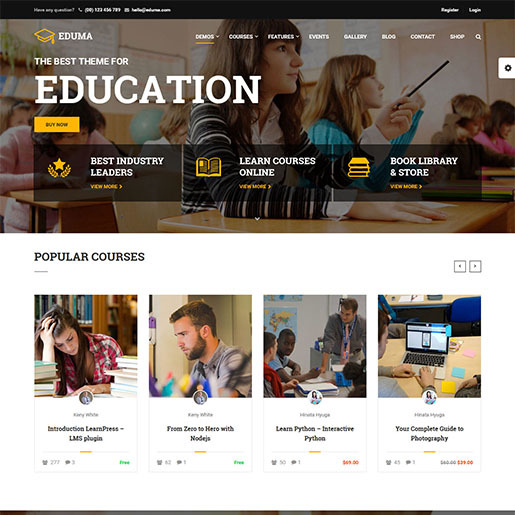 It is undoubtedly one of the best WordPress education themes built ever. A Learnpress based theme, Education WP helps you create that one click point to share that unending stream of information. Education WP tries to serve visual suitability and functionality hand in hand. The WPBakery and Site Origin page builder lets you be creative that fitting design for your educational content. WordPress’s #1 LMS plugin LearnPress comes shipped with this premium theme which makes creating educational courses, training sessions and updating them extremely easy along with creative Course building and commissioning programs. Furthermore, integration with bbPress and BuddyPress allows you to create a social hub for your students and tutors to communicate with each other and share enough information promptly. 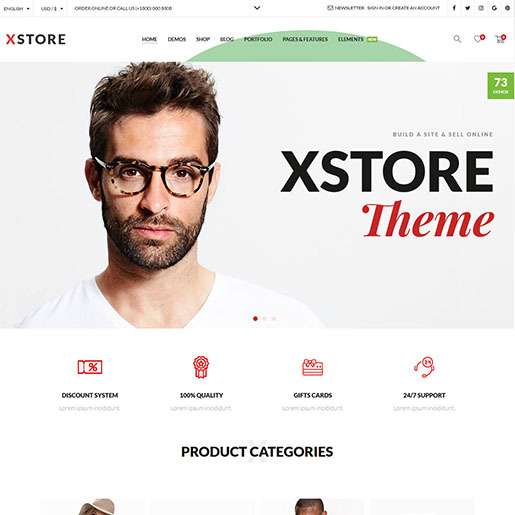 A WooCommerce based theme, XStore is an extremely reliable theme made for Business and eShops. With an easy to use detailed Mega-menu as well as the page building functions of WPBakery Page builder, creating a one-way point to sell your products has never been an easier job. XStore’s accompanying features of the Revolution Slider plugin, Top Filters area, Multiple products grid and multiple pre-built layouts for your shop design allow you to create a very handy and efficient shop design. The theme lets you add features such as animated sliders, video support for your products as well as a catalog mode, making sure that all your website viewers will be impressed by not only merchandise but also by your presentation. The theme requires basically zero coding knowledge to fully function as well, so you will less to worry about your website and care about improving your business. Furthermore, the theme comes with different page layouts for blogs, portfolios, Meet-the-team pages and more so you can give your viewers the complete experience of a welcoming company, straight from your home. Want alternative themes for starting a new eCommerce website? Check our collection of best WordPress eCommerce/ WooCommerce Templates. Accelerate Pro is a feature-rich multipurpose WordPress theme which is suitable for creating websites for various purposes. It is suitable for creating sites for business, portfolio, creative agency, personal blog, travel, corporates etc. The theme is 100% responsive so that your site content is sure to look great on all devices irrespective of the size and type of the screen. 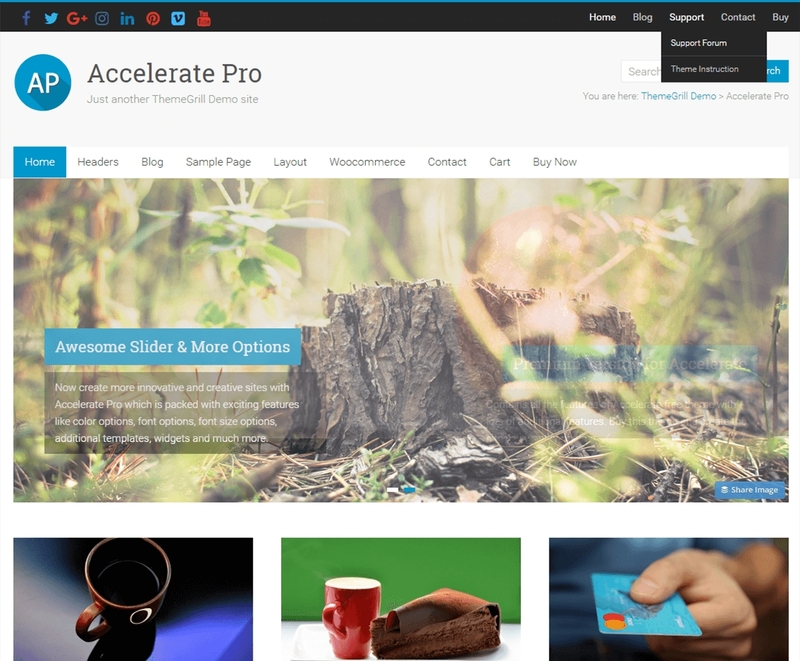 Accelerate Pro theme provides a professional business template for creating a complete corporate website. In addition, there are more than 6 custom widgets and over 8 widget areas so that you can easily place any piece of content beautifully anywhere on your site. Other features of the theme are advanced typography, primary color option, awesome slider, custom CSS, social icons etc. Furthermore, you can make your website look more beautiful and more useful with top header editor and footer editor. A bit different from others on this list, MyListing is a theme centered around directory and listing websites. From advertisement listing, location directories, real estate agency or event listing, you can build a website for it all with this extremely powerful tool. Powered by Elementor, one of best open-source page builders available, MyListing serves as a platform to build a listing website featuring beautiful designs and a range of neat features any user will find handy. MyListing allows you to create an interactive listing of any kind, whether it be a business directory, real estate listing or location documentation. From heavy explore page customization to enriching your core listing page, MyListing provides you tools to build it all in a matter of minutes. The theme also features heavy google map integration with custom themes, markers and location previews so that you can accurately show the location of your product dynamically. Listing type creator and editor, as well as individual customization support for each listing type, lets you preview a wide range of products to list and directories to show. All this can be done with barely any difficulty and 0 code knowledge, making MyListing one of the obvious choices for listing websites. The #1 selling BuddyPress theme of 2017, KLEO is one of the most premium MultiPurpose theme available on the web. 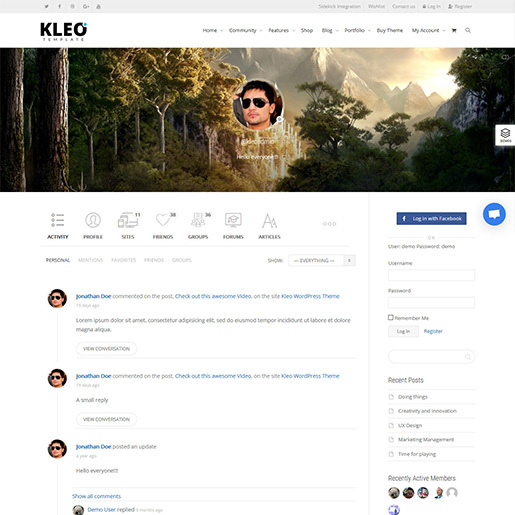 KLEO lets you build amazing websites with barely any effort regardless of what plan you in mind with its intuitive admin panel, front end page builder and native BuddyPress and WooCommerce support. With over 150 theme options, dozens of pre-built demos, unlimited font options, various header styles and column layouts, you will be able to build a perfect frontend for your online content and never have to look back again. Speed, ease of use and efficiency, KLEO presents it all. With its highly accommodating customization menu, you can turn any element on your web pages on/off, ensuring that website only presents what you want and stays at the top of the game when it comes to speed. Powered by WPBakery Page Builder, one of the most well-received Page builders on the market, KLEO comes with multiple header styles, Boxed and Wide page variations, drop down menus and custom tabs with carousels. For accommodating multiple types of websites, KLEO provides page designs for Blog sites, Community/Forum websites, portfolios, User account supported websites, etc The theme also includes Slider revolution plugin, Sensei e-learning plugin and Go – Pricing Table plugin for free as well as integrative support for popular third-party plugins such as bbPress, WooCommerce, WPML, Google map integrations and Facebook integrations. Check out our handpicked collection of best BuddyPress Themes and Templates. 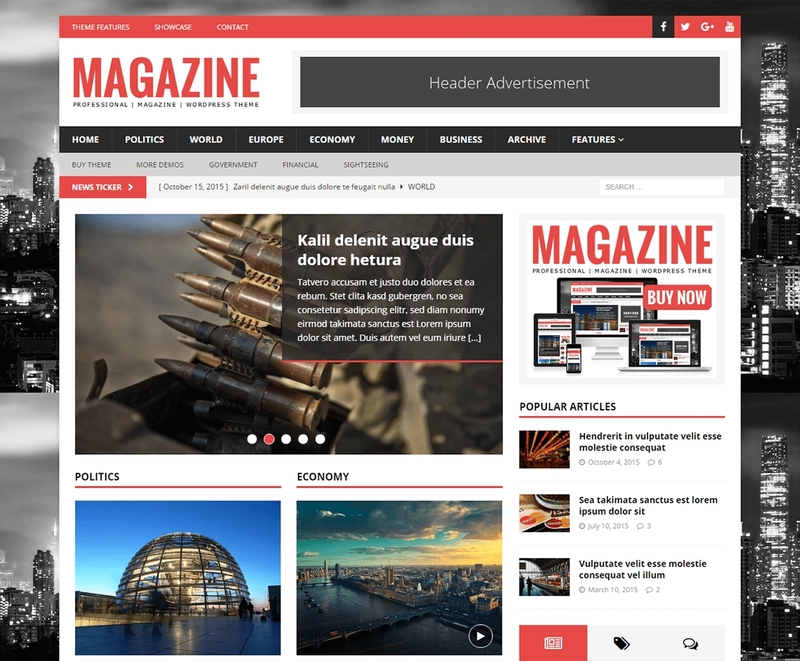 If you are looking for a WordPress theme for online magazine or news websites, MH Magazine is the perfect theme for you. It is a fully widgetized theme with live composer support so that you can enjoy the utmost flexibility. You can simply drag and drop widgets, re-arrange them and customize further as per your need. This way, you can build a unique design layout that represents your brand. Just view 15 stylish demos – you get the answer. The theme provides powerful theme options and features for creating a professional online magazine/ editorial website. It features beautiful responsive layout, FlexSlider2, Google web fonts, custom widgets, advanced theme options etc. Most noteworthy, it is coded with lots of care using the cutting-edge WordPress technologies so that it provides super-awesome user-interface, stunning design, and wonderful features. Professionals at MH Themes created this theme who also offer outstanding support to all of their customers. 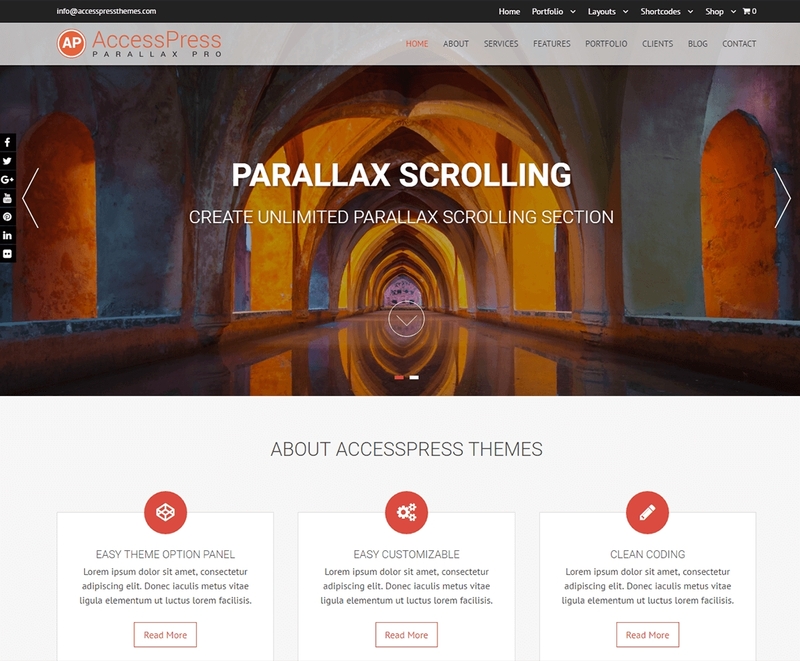 Yet another WordPress theme with parallax effect, AccessPress Parallax is a wonderful theme for your new project. The theme offers an alluring design layout along with a bundle of powerful customization options that let you create a website like you want. It comes with drag and drop page builder so that you can customize the website unlimited. With the demo importer, you can download the demo data with a single click, add content to it and instantly create demo like website. To customize the theme further, you will get 13+ drag and drop awesome widgets, plenty of shortcodes, and more. The theme integrates Slider Revolution which you can use to create beautiful sliders. Other features of the theme are custom CSS, custom JS, multiple page/ post layouts, advanced typography, multiple color options etc. The SEO friendly and speed optimized. 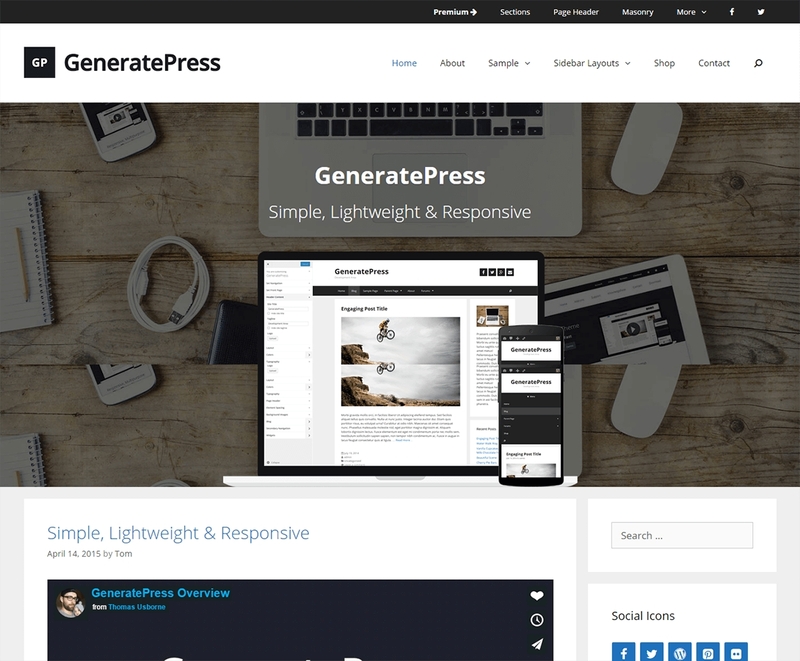 A powerful theme with complete support to wonderful WordPress plugins like WooCommerce, Beaver Builder, Elementor etc., GeneratePress Premium is a great theme for creating a revenue generating business websites. It is a fast and lightweight theme so that your website is sure to load faster. Integrated with schema.org microdata, it is search engine friendly. GeneratePress Premium comes with a collection of useful add-ons that offers you plenty of customization options. The main add-ons are colors, typography, sections, menu plus, page header, blog, backgrounds, spacing, secondary navigation etc. The theme allows you to add YouTube and Vimeo videos easily on your website and make it more engaging and comprehensive. With a deeper level of integration with WooCommerce plugin, it offers a beautiful page for your online shop. Therefore you can easily sell your products online and make money. 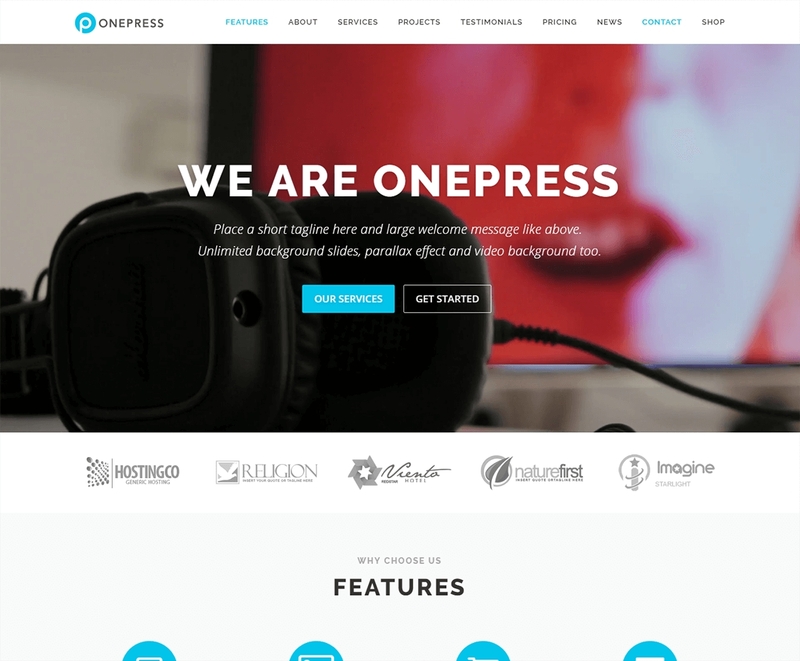 OnePress Plus is an outstanding one page WordPress theme with creativity. The theme is suitable for creating various types of websites including business, portfolio, digital agency, product landing page etc. It is the premium version of OnePress which comes with OnePress Plus plugin that adds powerful premium features to OnePress FREE. With OnePress Plus, you will get advanced section order and styling options, unlimited flexible sections, and more customization features. The theme supports astounding hero sections, background video, unlimited background slides so that you can create an impressive webpage instantly. It’s as easy as creating a CV with a template. It offers finely designed layouts for about, service, counter, team sections where you can add unlimited items easily. Besides, it has options to add the latest news, contact section, Google maps, pricing, testimonial section, call to action etc. In the nutshell, OnePress Plus is a complete theme with plus features. Already using any one of the above themes? Any thoughts/ feedbacks on them? Be sure to leave a comment below. You may also like to see our collection of the best FREE responsive WordPress themes. Nice themes Sunita. Thanks for posting. Great Collection there. Thanks alot. Great Collection! I’ve been using ColorMag for a long time and I think it’s a great theme. This is an awesome list of themes. Now a days themes like Divi, Astra are very popular due to their drag & drop feature. Many thanks for sharing this. Colormag and newspaper are my favorite themes. Thanks for sharing such details info about so many themes. What a great WP themes list, all of those WP themes are so cool. Thanks Sunita! I think Genesis Framework good for SEO. Kleo and Xstore are two very great themes, have worked on them for some clients and never had any issue while editing them. Great Post, btw! 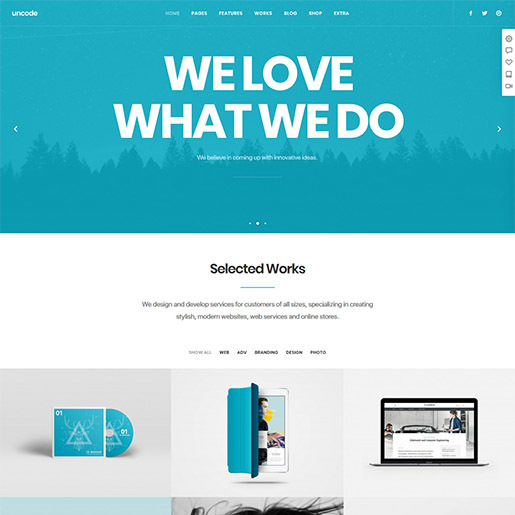 Hello, A big thanks for this great WordPress theme collection. Hello Erik, Thank You for the comment. Glad you found it helpful! Color Mag Pro is one of best. This was a great and informative post. Thank you for sharing ! Great collection. Do you have one for healthy lifestyle blogs?